Tradesmen among the early British settlers in the United States brought with them their tools in tool chests. At the lively auction held by David Stanley Auctions on 28 September, history almost repeated itself with many of the 1,157 lots being bought by American dealers and collectors. At the end of the sale boxes and cases of tools were to be seen being readied for shipment to America. 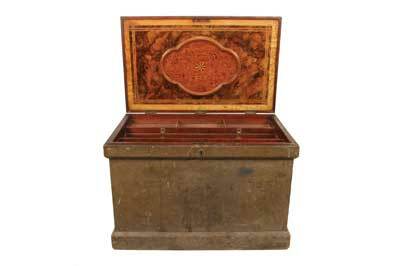 But, although two fine tool chests had been on offer in the sale, neither of them ended up in American hands. The next international David Stanley Auction is on Saturday 29 March, 2014, at the Hermitage Leisure Centre, Whitwick, Leicestershire LE67 5EU. For more information click here. More information about David Russell's collection is in his book Antique Woodworking Tools: Their Craftsmanship from the Earliest Times to the Twentieth Century - click here to find out more. There was strong American interest in early American tools. From the David R. Russell collection came a wedge-arm plough plane stamped by America's first recorded specialist plane-maker. 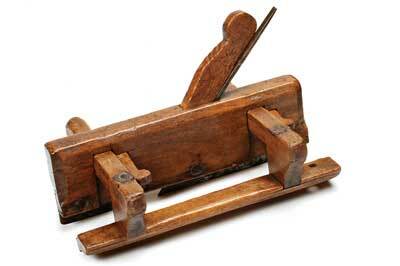 Said to be the earliest known Nicholson plane found to date, it sold for Â£4,140, including a buyer's premium of 15%. 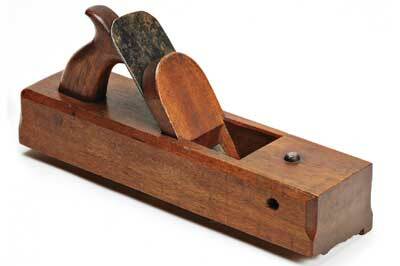 An ostensibly humble moulding plane went to a New York collector for Â£6,325. This sturdy but utilitarian birch moulder bearing the stamp of N. Potter aroused surprisingly great interest. 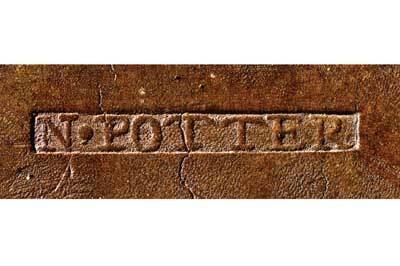 Ever since The Chronicle, the journal of the Early American Industries Association (EAIA), ran a convincing article in 1993 about identifying who N. Potter might have been, tools bearing his stamp have become that much more desirable, for much evidence points to the identification of Mr Potter as a Quaker house carpenter called Nathaniel Potter, who was born in 1693 in Lynn, Massachusetts, and died in 1768. If indeed this is our man, his dates make him the earliest plane maker in America to have stamped his tools, probably even before Francis Nicholson began making planes in Massachusetts, in about 1728. 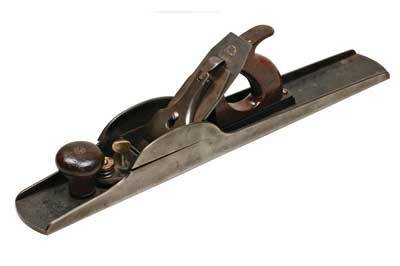 With the development of industrial techniques in the United States the metal plane swept through the American building industry in the mid-19th century, soon ousting the wooden plane. When Leonard Bailey invented the definitive method of securing and adjusting the cutter, the way forward for the metal plane was clear. 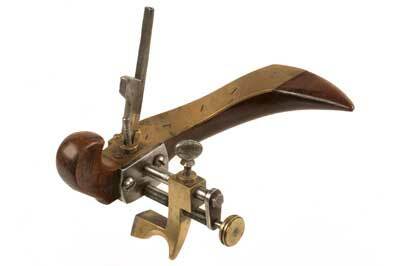 A split-frame plane with the camlock lever cap stamped by Bailey, again from the Russell collection, fetched Â£4,830, going to an American absentee bidder. Two Continental European coachbuilder's plough planes, with a gracefulness that clearly appealed to bidders, were among the highest selling lots. 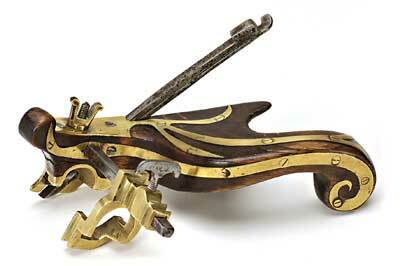 The magnificent unmarked compass plough from the Russell collection, with its brass castings and inset foliate strengtheners, fetched Â£4,370, going to an American bidder in the room, while the compass plane stamped by the renowned Viennese makers Johann Weiss & Sohn, from the Luigi Nessi collection, went to a German collector in the room for Â£1,955. British, Irish and Hong Kong buyers snapped up some of the best Norris planes for sale; the highest selling lot in the auction being a 281/2in Norris A1 jointer which sold to a British bidder in the room for Â£9,430. A buyer from Kent was able to secure a particularly fascinating set of timber samples, each marked with both common and Latin names, for Â£310. 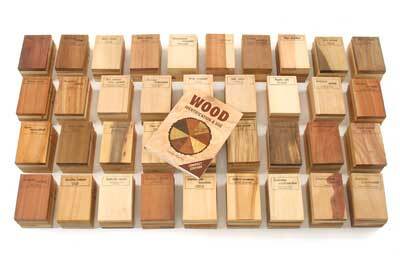 These samples had been used by Terry Porter when compiling his book Wood Identification & Use. It was a pity that neither the samples nor the book included the fine-grained wood known as cormier in France and much used by French tool-makers for the stocks of their wooden planes. Charles Holtzapffel, the great Victorian tool-maker, identified that timber as service-tree. Among the wonderful selection of braces on offer was a rare brass-framed boxwood (Buxus sempervirens) brace by Marsden Brothers of Sheffield that was knocked down at Â£1,725 to a British buyer in the room. "Prices remained firm,â€ said David Stanley after the sale. â€œInterest and bids were forthcoming from 14 countries including Hong Kong, New Zealand and Australia."